Detects DNA methyltransferase 1 associated protein (DMAP1). Synthetic peptide corresponding to Mouse DMAP1 aa 435-450. DNA methyltransferases methylate the 5-position of cytosine in the context of CpG dinucleotides. DNA methylation is crucial for normal embryonic development, imprinting, and X-chromosome inactivation. DNA methyltransferase 1 associated protein (DMAP1) has been shown to interact directly with the N-terminus of DNA Methyltransferase 1 (Dnmt1) throughout DNA replication during S phase. DMAP1 has also been identified as a critical gene product in myotonic dystrophy. Our Abpromise guarantee covers the use of ab2848 in the following tested applications. WB 1/500. Predicted molecular weight: 52.9 kDa.Can be blocked with DMAP1 peptide (ab4919). 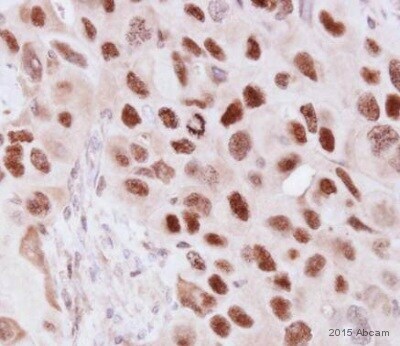 Immunohistochemistry (Formalin/PFA-fixed paraffin-embedded sections) analysis of DMAP1 showing staining in the cytoplasm and nucleus of paraffin-treated human esophageal carcinoma tissue (right) compared with a negative control in the absence of primary antibody (left). Antigen retrieval was performed using 10mM sodium citrate (pH 6.0), microwaved for 8-15 min. Tissues were blocked in 3% H2O2-methanol for 15 min at room temperature, washed with ddH2O and PBS, and then incubated with ab2848 diluted by 3% BSA-PBS at a dilution of 1:100 overnight at 4°C in a humidified chamber. Tissues were washed extensively in PBST and detection was performed using an HRP-conjugated secondary antibody followed by colorimetric detection using a DAB kit. Tissues were counterstained with hematoxylin and dehydrated with ethanol and xylene to prep for mounting. Immunohistochemistry (Formalin/PFA-fixed paraffin-embedded sections) analysis of DMAP1 showing staining in the cytoplasm and nucleus of paraffin-treated mouse brain tissue (right) compared with a negative control in the absence of primary antibody (left). Antigen retrieval was performed using 10mM sodium citrate (pH 6.0), microwaved for 8-15 min. Tissues were blocked in 3% H2O2-methanol for 15 min at room temperature, washed with ddH2O and PBS, and then incubated with ab2848 diluted by 3% BSA-PBS at a dilution of 1:100 overnight at 4°C in a humidified chamber. Tissues were washed extensively in PBST and detection was performed using an HRP-conjugated secondary antibody followed by colorimetric detection using a DAB kit. Tissues were counterstained with hematoxylin and dehydrated with ethanol and xylene to prep for mounting. Immunohistochemistry (Formalin/PFA-fixed paraffin-embedded sections) analysis of DMAP1 showing staining in the cytoplasm and nucleus of paraffin-treated mouse uterus tissue (right) compared with a negative control in the absence of primary antibody (left). Antigen retrieval was performed using 10mM sodium citrate (pH 6.0), microwaved for 8-15 min. Tissues were blocked in 3% H2O2-methanol for 15 min at room temperature, washed with ddH2O and PBS, and then incubated with ab2848 diluted by 3% BSA-PBS at a dilution of 1:100 overnight at 4°C in a humidified chamber. Tissues were washed extensively in PBST and detection was performed using an HRP-conjugated secondary antibody followed by colorimetric detection using a DAB kit. Tissues were counterstained with hematoxylin and dehydrated with ethanol and xylene to prep for mounting. Immunocytochemistry/ Immunofluorescence - Anti-DMAP1 antibody - ChIP Grade (ab2848)This image was kindly submitted by Kirk McManus, as part of an abreview. ab2848 staining DMAP1 in asynchronous HeLa cells in conjunction with a secondary goat anti-rabbit antibody conjugated to Cy3 ® (green). Cells were counterstained with DAPI (red) to show the nucleus. Please refer to abreview for further details. Western blot - Anti-DMAP1 antibody - ChIP Grade (ab2848)Image from Lee GE, et al, J Biol Chem. 2010 Nov 26;285(48):37630-40. Epub 2010 Sep 23, Fig 2. 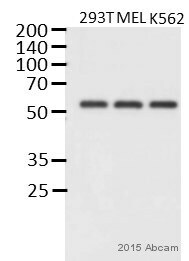 Western blot - Anti-DMAP1 antibody - ChIP Grade (ab2848)Image courtesy of an anonymous Abreview. Publishing research using ab2848? Please let us know so that we can cite the reference in this datasheet.